The green scenery of Yakushima. Heritage Site in December 11, 1993. Yakushima is a round island floating above Kuroshio, and is located about 130 km south of Kagoshima city as a detached island in Kagoshima prefecture. The island has an area of 504.86 km2, and it is the sixth largest remote island after Sado Island, Amami-Oshima Island, Tsushima Island, Awaji Island, and Amakusa Shimoshima Island. Tanegashima Island is at the seventh position after Yakushima, with a total area of 444.94 km2. Yakushima can be reached within 30 minutes by plane from Kagoshima Airport, in 1 hour 50 minutes by high-speed ferry from Kagoshima Port or 3.5 hours by ferry from Yakushima 2 Kagoshima Port. 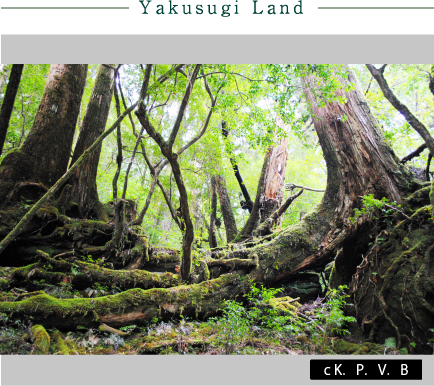 Yakushima is about 132 km in circumference, 504.86 km2 in area, with a population of 14,000 people. 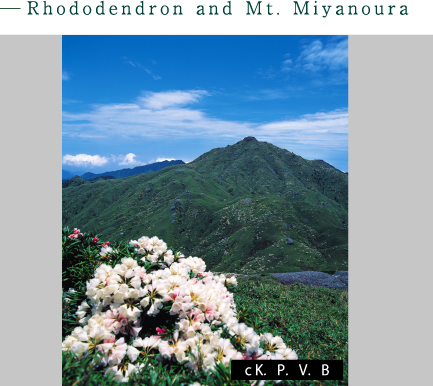 In the center of the island there are about 300 mountains, including Kyushu's highest peak, Mt. Miyanoura (1,935 m). Yakushima is cut in half horizontally, with Kamiyaku Town to the north, and Yaku Town to the south, and small settlements are dotted around the island. By the way Kuchinoerabujima is also a part of Kamiyaku Town. Tashiro Annex is located at Miyanoura, the gateway to Yakushima. There are 3,500 people living in Miyanoura. The distance from Miyanoura Port to our hotel is about 2 km (30 minutes on foot or 4.5 minutes by car). It can also be reached in 15 minutes by car from Yakushima Airport in Koseda. Tashiro Annex is located at the upper part of the Miyanoura River at the Tosenkyo Bridge. 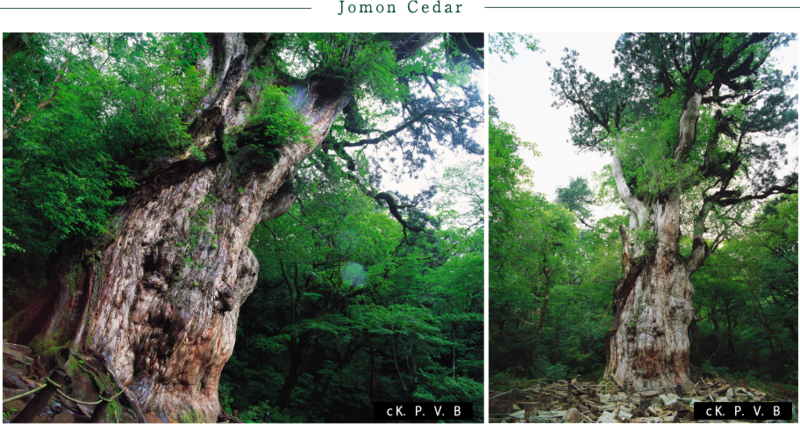 Jomon Cedar was discovered in 1966.
and the name was changed because it resembles the shape of Jomon-era pottery. Visitors can also enjoy the view from their cars, which is one of the charms of this object. Yakushima has a particularly high rainfall, causing the formation of enormous rock cliffs, which are covered by native vegetations. It is a symbol of a valley. 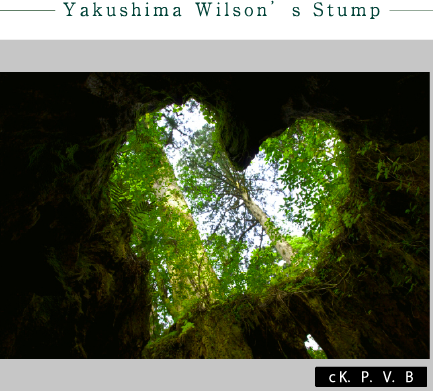 It was popularized by Dr. Wilson from the United States, thus it was named Wilson’s Stump. 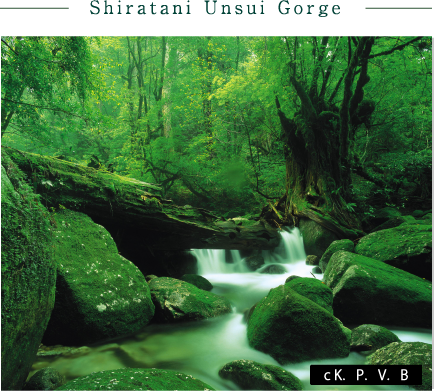 It is a natural recreation forest with an area of ​​270.33 hectares, located upstream of Arakawa. Its entrance is located about 16 km from Anbo at about 1000-m altitude. 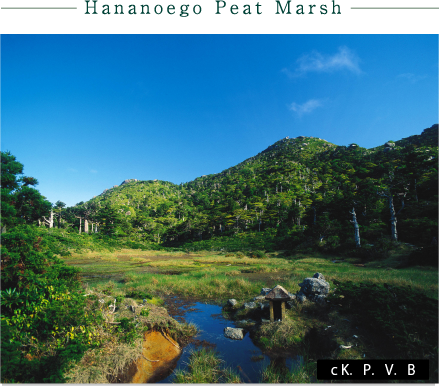 At an altitude of 1600 m, the Hananoego Peat Marsh is a valuable elevated wetland. Beautiful rhododendron flowers bloom from May to June each year. 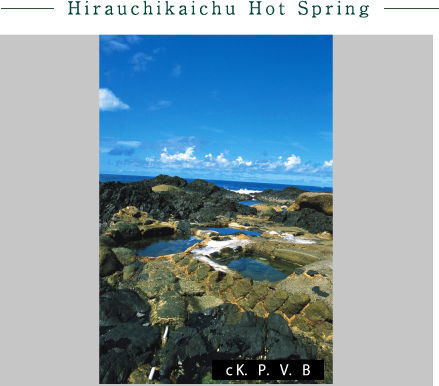 This is a rare hot spring that springs from a source below the sea level at the southern tip of Yakushima. With high rainfall throughout the year, the flowing water becomes rivers that cut through rocks and mountains in its travel to the sea. It seems somewhat far when seen from the observatory, but its majestic appearance can be fully enjoyed. 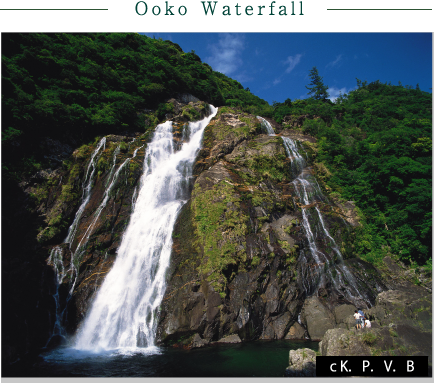 This magnificent waterfall has the highest volume of water in Yakushima, and was chosen as one of “100 Waterfalls of Japan” (selected on April 4, 1990). 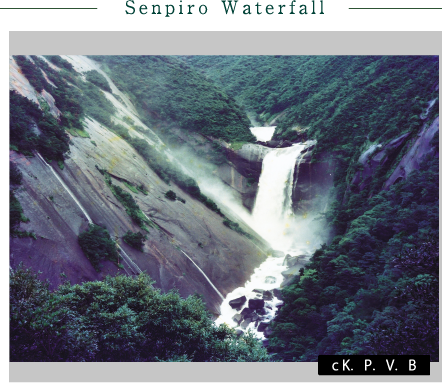 From an 88-meter cliff, the beautiful waterfall cascades torrents of water down, allowing visitors to feel the dynamic of nature. Mt. 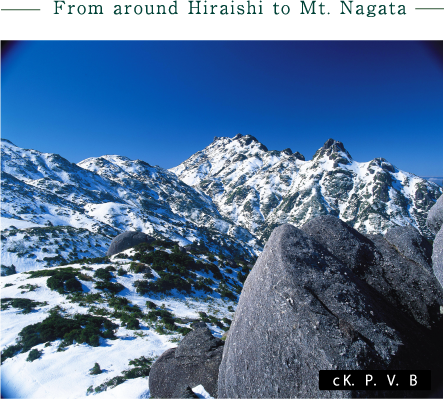 Nagata is Kyushu's second highest peak. There is a climbing trail that runs from Mt. Miyanoura. The scenery at the summit is wonderful. 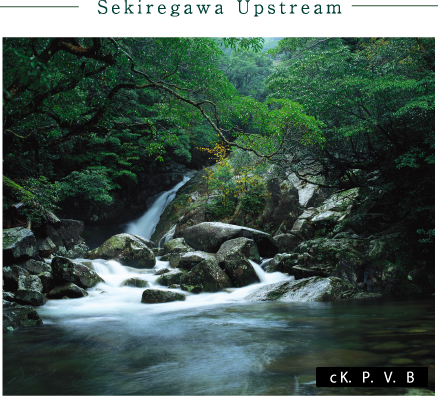 The Sekiregawa River, located in the western part of Yakushima, is one of the three major rugged valleys in Yakushima. 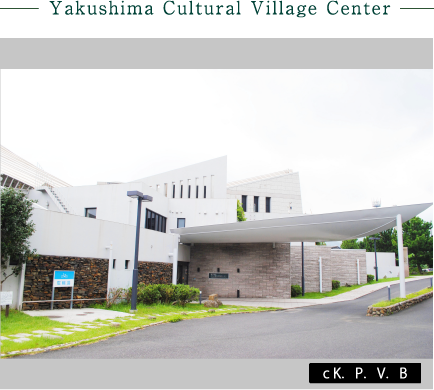 The Yakushima Environmental and Cultural Village Center is a base facility for promoting the "Yakushima Environmental and Cultural Village Concept" aiming to create a new area that coexists with nature. 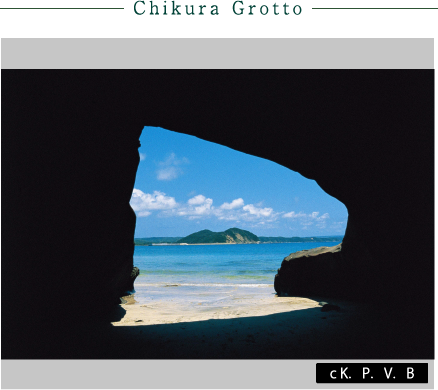 On the east coast of Tanegashima Island, visitors can see a rocky shore washed by the rough waves of the Pacific Ocean. 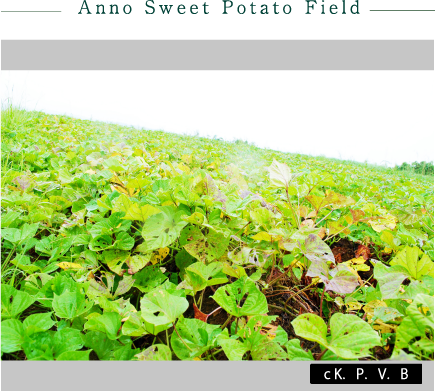 Anno sweet potato is different from other sweet potatoes. It is very delicate and it skin may peel off easily if it is not handled carefully. It takes time and effort to harvest and ship. It is a world natural heritage that can also be reached by car. 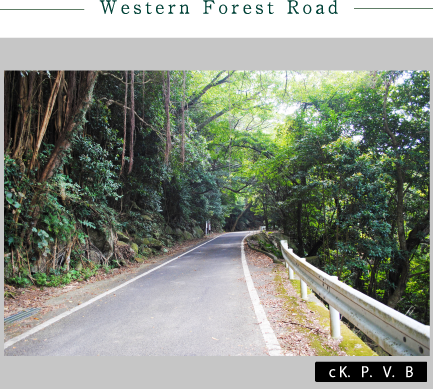 Visitors can see a panoramic view of Japan's largest evergreen forest, one of the reasons for Yakushima to be chosen as a World Natural Heritage Site. In the western part of Yakushima, you can easily find Yaku deers and Yaku monkeys.